Allowing employees to work remotely is one of those great perks of the new age. People often love the ability to make their own hours at home, giving them the opportunity to take care of household chores, look after kids or even just avoid having to pay for the daily commute. Employers also have plenty to value in remote workers, who often have flexible schedules, cut down on needed real estate at the office and, if the remote workers are in a different city or country, could possess a specialized knowledge and perspective different from the rest of the company culture. Yet, the independence of remote employees can also be a weakness. An office of workers in different locations that must rely on phone and email can make working as a team difficult, which is especially bad for small businesses or start-ups that need all of their workers on the same page. The problem of a fractured office isn’t just a matter of having to rely on digital and phone communications – there is also the mental component of remote employees not feeling as part of the team. Managing remote workers means learning how to incorporate them into the company culture in more ways than one. In addition to streamlining communications, small businesses should learn how to use planned events, meetings and even promotional products as ways to bring workers into the fold. One of the more popular methods to interact with remote employees is through video conferences, according to Small Business Trends. It allows organizations to see as well as hear their peers, creating a greater sense of interaction and inclusiveness. New technology is making this kind of communication easier than ever, as people can just power up their tablets anywhere with a decent wireless connection. The technology is getting so fine-tuned that there is even a camera that will recognize when someone is making eye contact with a screen, and will automatically switch on a microphone. Inc. Magazine has even suggested that companies consider an all-day video conference. 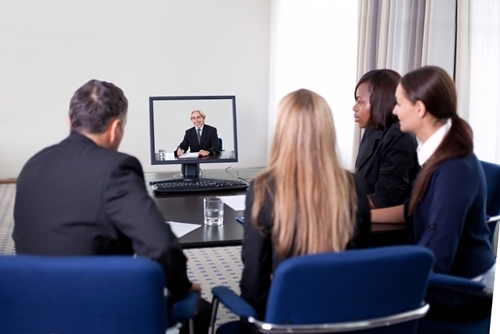 Video conferences can be helpful, but essential to their success is having them regularly. Chris Sugai, the CEO of Niner Bikes told Inc. Magazine that allowing employees to work remotely was the best thing his company has ever done, but that it’s important that the entire company gathers for a video conference to discuss issues. Additionally, managers are expected to communicate every week. This keeps employees in the loop, which he says is especially important with overseas production teams. Regular meetings aren’t just the only concern for remotely-based businesses. They also need to crack the code of team bonding, which seems next to impossible when some offices are located in different regions or even time zones. Sugai, whose company sells mountain bikes, has a policy of closing down the offices every year so that the 30 employees scattered across the globe can spend four days camping and riding mountain bikes as a group. This seems not so different than the idea of the company retreat, but he says the staff is always talking and emailing about where to ride or their newest bike purchases. Some companies may not be able to host such retreats, but at the very least they can find ways of reaching out and engaging their employees. Periodic promotional giveaways may be a way of reaching out to employees while helping them to feel more involved with the company from their homes. Businesses may also want to set up chat forums or encourage monthly get-togethers as a way of engaging employees in a fun manner.